Jilin Province (吉林) is a mostly inland province in Northeast China. Changchun is the provincial capital, and Jilin City is the province&apos;s second largest city. Jilin Province has been important in Chinese history as an industrial region and as the homeland of the Jin (Manchu) ethnic group who controlled big empires twice in the past. For tourists, the main attractions are mountains, skiing, winter scenery, and the cities for museums. Jilin is well-connected by bullet train to Beijing and the rest of the country. The high latitudes and altitudes make Jilin&apos;s mountains ski areas. Jilin Province is situated in the central part of Northeast China. The capital city is Changchun. It borders Heilongjiang Province to the north, Liaoning Province to the south, Inner Mongolia to the west, and Russia to the east. North Korea and Jilin Province are separated by only the Yalu River. The terrain of Jilin Province is complex. The province has chains of mountains, rivers and lakes, and wide plains. These places provide plenty of beautiful natural scenery. The far eastern side of the province is a coastal area. The population of Jilin Province in 2019 is about 28 million. It is a province where the people earn about 8,000 USD per year. Compared to the rest of China, this is about average. The Han nationality make up 90% of the population. Jilin Province is also the homeland of some ethnic groups such as the Manchu, Mongol and Xibe. There are about a million Manchu and 150,000 Mongolians. Other ethnic groups include 150,000 Hui. The province borders North Korea, and there are 1.2 million Koreans. The Korean culture can be seen in Ji’an in Tonghua City. Jilin Province is in northeastern China. Click for more Jilin maps. Changchun has about 3.5 million people in the urban area. It grew into an important city in Jilin in the early 20th century when first the Russians in 1898 and then later the Japanese constructed railway facilities in the city. It became famous for auto production and heavy industry. In the city, the Museum of the Imperial Palace of Manchukuo is recommended. Jilin City has a population of 1.5 million. It is notable for tourists because it is about an hour&apos;s drive from the Changbai Mountains and Beidahu Ski Resort. It&apos;s also famous for the frosty scenery of its Rime Festival. Tonghua (along with Yanji, Siping, Baishan, and Songyuan) has an urban population of about 0.5 million. Tonghua is notable for tourists as a place with a big population of Koreans where you can eat Korean food and see the border with Korea at the Yalu River Border Tourism Zone. Small ski resorts and mountain forests are its other attractions. Jilin weather is generally cold. The lengthy snowy period lasts from December to April and makes the province a good place to ski and view the magnificent Rime Scenery. January is the coldest month with an average temperature of about -18 °C (-0.4°F) in both Changchun and Jilin. The temperatures in each region differs according to elevation and proximity to the sea. The province is moderate to dry: annual rainfall averages between 350 to 1000 mm . The Jilin Rime Ice Festival is nominally December-February. The clean and pure scenery of Jilin&apos;s Rime, along with the karst landscape of Guilin, the Stone Forest in Yunnan, and the Three Gorges on the Yangtze River are hailed as "The Top Four Natural Wonders in China". Rime is a natural phenomenum turning up in the bank of the Songhua River during severe winter when the willow branches and pine needles along the river are all hanging with pure white rimes in shapes of silk threads, chrysanthemums and corals. The wonder often appears in the early morning in the period from December to February. Read more about Jilin Weather. There are numerous historical sites. Koreans, Manchus, and Japanese have all claimed this territory, and they left behind historical places. The Manchus conquered the Ming Dynasty (1368–1644) and founded the Qing Dynasty (1644–1911). Before that, they conquered a big territory north of the Yangtze River and made Beijing the capital of the Jin Empire. Before the Jin expansion, a Korean kingdom ruled the area. This is partly why there are so many Koreans near the North Korea border. This kingdom was conquered by the Tang Empire in 668. The Koguryo Historical Site in Tonghua City has been included on the UNESCO’s World Heritage Site List. It contains the remains of three cities and forty identified tombs of Koguryo imperial and noble families. The province started to grow quickly when the province was industrialized in the early 20th century. The Russian-built railroad and the Japanese development of a railroad network allowed the development of the region&apos;s mineral resources. Changchun became one of the hubs of the Japanese controlled railroad system that they used after invading Manchuria in 1932. The province&apos;s location made Jilin a bridge between Korea, Japan, Russia and the rest of China. Jilin City was briefly provincial capital from 1949 to 1954, before Changchun became the political center once more in Communist China. After WWII, China&apos;s first automobile industry was established in Changchun. It is sometimes still called the "Detroit of China". Jilin is important now for heavy industry, agriculture, and forestry. Northeastern Cuisine: Jilin&apos;s local cuisine is called Dongbei Cuisine (东北菜 &apos;Northeast Food&apos;). Their cuisine is noted for very being much like Korean cuisine. You will find lots of the Jilin version of kimchi and other kinds of pickled vegetables. Like the Japanese, they like to eat raw fish and sealife. Like the Koreans, they like to braise and sauté meat. The Manchus originated many of the popular dishes, and you&apos;ll find lots of Manchu food. Unlike Chinese further south, their staple grains are wheat and corn instead of rice. You&apos;ll find cornbread, corn porridge, and wheat pastries, breads, and noodles. See more on Northern China Food. Jilin Province has a variety of cultural and natural attractions. The Changbai Mountains Natural Reserve is in the eastern side of the province. The peaks are sharp, and the mountains have tracts of dense forest. It has hot springs and waterfalls. A lot of snow accumulates in the winter and makes it one of China&apos;s top skiing areas. 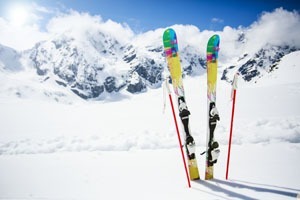 The lengthy snowy period lasts from December to April, so the province is a good place to ski. 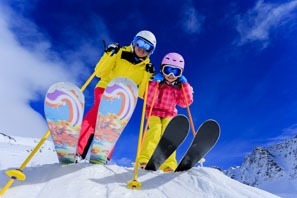 See Changbai Mountain Skiing and Beidahu Ski Resort that is one of China&apos;s Top Ski Resorts. We suggest it as a place to go during hot Chinese summers further south. The Baekdu Mountain Hot Springs in the mountains contain rich hydrogen sulfide and a variety of trace elements. It is called "miraculous water" with curative effect on gastrointestinal diseases, skin diseases, hypertension, heart diseases and gynecological disease. Most of the water of Baekdu Mountain Hot Springs is above 60 °C. The hottest source is as high as 82 °C. It is a ideal place to recuperate, rest, and recreate in the cold of winter. 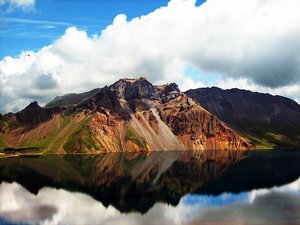 Heavenly Lake is called the blue jewel of the Changbai Mountains. The lake is notable since it is new. The present lake was formed in 969 AD in a volcano crater. It is at an altitude of 2194 meters (7,200 feet) and is surrounded by 16 peaks. Koreans especially revere the lake. The Changbai Mountains are a Place to Escape China&apos;s Crowds during holidays. Also see The 6 Best Places in China in January. High-speed trains make going to Jilin easier. New bullet train routes are available. Via bullet train, you can travel on G class trains from Beijing to Jilin City in 6 hours (68 USD second class). D class trains travel in 7 or 8 hours (42 USD second class). From Beijing to Changchun, G class trains travel in less than 6 hours (63 USD second class). D class trains (40 USD second class) travel in 6.5 or 7 hours. Bullet train travel from Harbin to Changchun takes about an hour on G class trains (16 USD second class) and about 1.5 hours on D class trains (11 USD second class). Check for more information and ticket booking at China Trains. 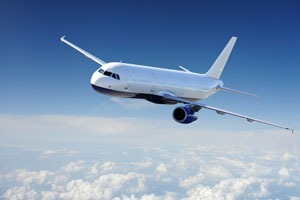 There are two airports in Jilin Province: one is in Changchun and the other is in Yanji city. These two airports offer flights to dozens of big cities in China such as Beijing, Shanghai, Guangzhou, Xiamen, and Xi’an. Railway transportation in Jilin is very convenient. It is covered by 7 railroad lines, and travelers can get to most parts of Jilin Province. Jilin Province is connected with cities in other provinces by railway such as Qiqihaer in Inner Mongolia, Harbin and Shenyang. The highway system centers on Changchun City, and you can reach most parts of Jilin Province by highway as well. Travelers also can take buses to go to some cities in other provinces such as Harbin, Heihe City in Heilongjiang Province, Shenyang and Dalian City in Liaoning Province and Ulanhot City in Inner Mongolia. See more on Changchun Transportation and Jilin Province Transportation. Harbin is the largest city in China&apos;s far north, known for its Ice and Snow Festival. Beijing, as the gateway to Jilin and China&apos;s Northeast, absolutely must be visited. Our 8-Day Golden Triangle Bullet Train Tour to Shanghai, Xi&apos;an and Beijing utilizes the convenience of the bullet trains. We could extend this for a visit to Jilin via bullet train.